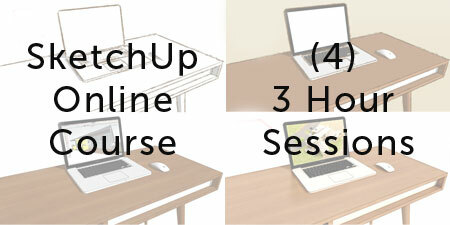 I’m happy to announce that I will be providing online SketchUp classes monthly. The session will be spread over 2 weeks providing (4) 3 hour sessions from 9am – 12pm EST. This lesson provides the idea workflow for using SketchUp with your CAD software. Import 2D CAD files and learn tips and tricks for organizing line-work, creating reference groups, aligning elevations, and constructing 3D models quickly. Also, we’ll show you how to save time with some clever plugins for this workflow. This lesson gives you the tricks and techniques to create photorealistic renderings with SketchUp and a plugin called Podium. Learn how to create reflective materials, lights, and techniques for interior and exterior renderings. This session finishes up by creating a composite rendering and making adjustments in Photoshop. By purchasing the full session, students will receive a free copy of “Learning SketchUp 2013″ DVD.